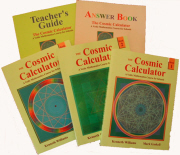 There are many features of the Vedic system which contrast significantly with conventional mathematics. Coherence - Perhaps the most striking feature of the Vedic system is its coherence. Instead of a hotchpotch of unrelated techniques the whole system is beautifully interrelated and unified: the general multiplication method, for example, is easily reversed to allow one-line divisions and the simple squaring method can be reversed to give one-line square roots. And these are all easily understood. This unifying quality is very satisfying, it makes mathematics easy and enjoyable and encourages innovation. Flexibility- In modern teaching you usually have one way of doing a calculation. This is rigid and boring, and intelligent and creative students rebel against it. Once you allow variations you get all sorts of benefits. Children become more creative. The teacher is encouraging innovation and the children respond. In the Vedic system there are general methods, that always work, for example a method of multiplication that can be applied to any numbers. But the Vedic system has many special methods, when a calculation has some special characteristic that can be used to find the answer more easily. And it's great fun when you spot that method. Having only one method of, say, multiplying is like a carpenter who uses a screwdriver for every job. The skilled craftsman selects the tool most appropriate for the job and gets it done quicker, better and with more satisfaction. So there are special methods, that apply in special cases, and also general methods. You don't have to use these special methods but they are there if you want to. Calculations can often be carried out from right to left or from left to right. You can represent numbers in more than one way; we can work 2 or more figures at a time if we wish. This flexibility adds to the fun and gives pupils the freedom to choose their own approach. This in turn leads to the development of creativity and intuition. The Vedic system does not insist on a purely analytic approach as many modern teaching methods do. This makes a big difference to the attitude which children have towards mathematics. In this rapidly changing world adaptability and flexibility are absolutely essential for success. For the future we can expect more change and perhaps at a more rapid pace. Mental, improves memory - The ease and simplicity of Vedic Mathematics means that calculations can be carried out mentally (though the methods can also be written down). There are many advantages in using a flexible, mental system. Pupils can invent their own methods, they are not limited to the one 'correct' method. This leads to more creative, interested and intelligent pupils. It also leads to improved memory and greater mental agility. Bear in mind also that mathematical objects are mental objects. In working directly with these objects as in mental maths you get closer to the objects and understand them and their properties and relationships much better. Of course there are times especially early on when physical activities are a great help to understanding. Promotes creativity - All these features of Vedic math encourage students to be creative in doing their math. Being naturally creative students like to devise their own methods of solution. The Vedic system seeks to cultivate intuition, having a conscious proof or explanation of a method beforehand is not essential in the Vedic methodology. This appeals to the artistic types who prefer not to use analytical ways of thinking. Appeals to everyone - The Vedic system appears to be effective over all ability ranges: the able child loves the choice and freedom to experiment and the less able may prefer to stick to the general methods but loves the simple patterns they can use. Artistic types love the opportunity to invent and have their own unique input, while the analytic types enjoy the challenge and scope of multiple methods. Increases mental agility - Because the Vedic system uses these ultra-easy methods mental calculation is preferred and leads naturally to develop mental agility. And this in turn leads to growth in other subjects. Efficient and fast - In the Vedic system 'difficult' problems or huge sums can often be solved immediately. These striking and beautiful methods are just a part of a complete system of mathematics which is far more systematic than the modern 'system'. Vedic Mathematics manifests the coherent and unified structure naturally inherent in mathematics and the methods are direct, easy and complementary. Easy, fun - The experience of the joy of mathematics is an immediate and natural consequence of practising Vedic Mathematics. And this is the true nature of maths - not the rigid and boring 'system' that is currently widespread. Methods apply in algebra - Another important feature of the Vedic system is that once an arithmetic method has been mastered the same method can be applied to algebraic cases of that type - the beautiful coherence between arithmetic and algebra is clearly manifest in the Vedic system.